In the years that I’ve been creating things in Pure Data I have amassed quite a collection of unfinished and messy patches. Over the last few days I have been releasing a few of these patches and techniques that I implement when programming in Pure Data. The last tutorial isn’t that much about actually programming with Pure Data and is more about performing with it. More specifically, live coding. Live coding takes programming to a performative level. 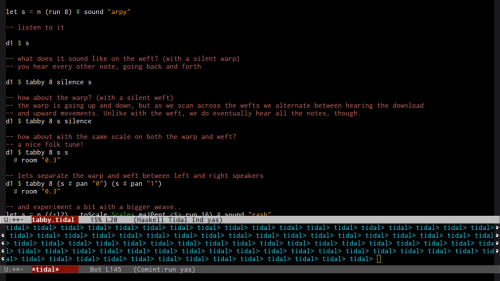 There’s been a lot of writing recently about Live Coding so take a look around. 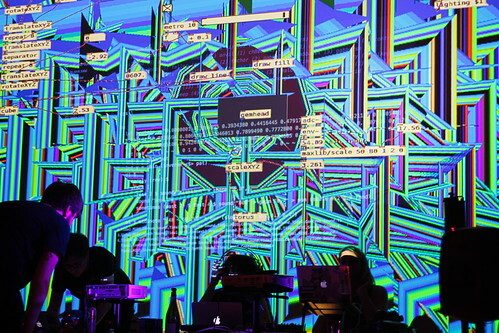 I’ve been programming live visuals for Pure Data since 2014 (a lot happened that year). It’s not without it’s problems, some of which I written about in the past. One problem I’ve found is displaying your patch alongside your visuals. 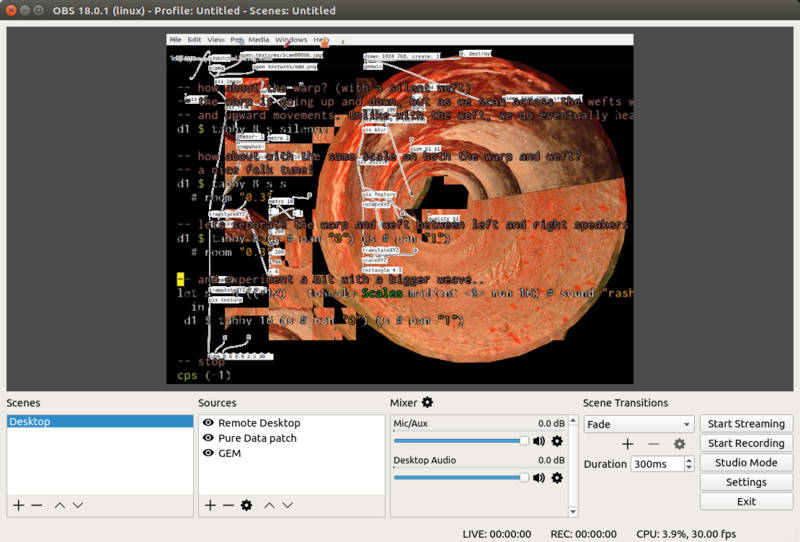 For live coding musicians this isn’t much of a problem as the output of the live patching is sent to the sound card, not necessarily the screen. For people live coding visuals in Pure Data the output (projector) would be needed for both the visuals output and the patch. 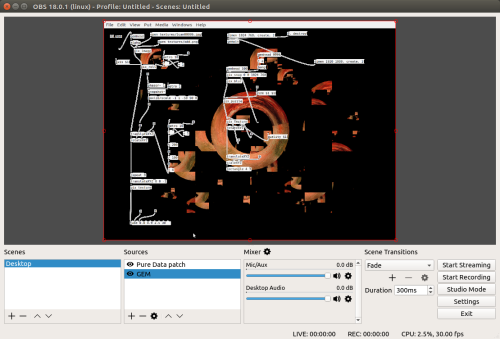 If only there was a way to overlay the patches onto visuals (like in Fluxus, Cyril and Livecodelab)! 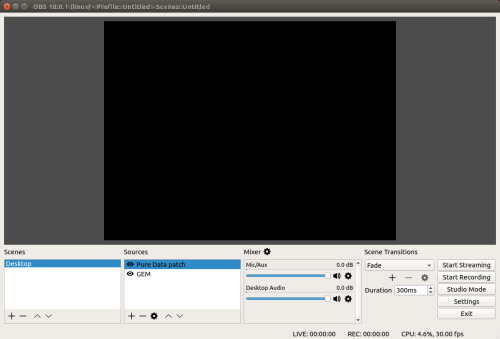 The most reliable cross-platform method to do this is to use Open Broadcaster Software (OBS). OBS is a great piece of software used by many gamers for livestreaming. A great feature of it is to be able to combine multiple media sources into one to then stream or send to a projector or video file. 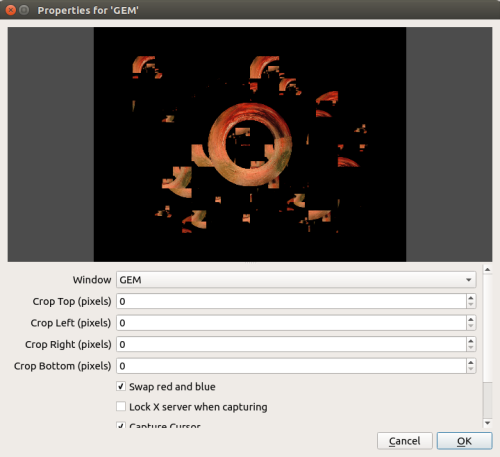 To overlay your patch onto your visuals first create a GEM window with some graphics in it. In OBS, under Source click the + button and choose Window Capture. Give the new source a name. And then, under Window choose your GEM output window. Next, create a new Window Capture source and give it a name (perhaps Pure Data patch). You may have noticed that your patch completely covers your GEM source. No worries! Right-click on your Pure Data patch source and click on Filters. In the next window click on the + button and choose Chroma Key. Give the new key a name (White). 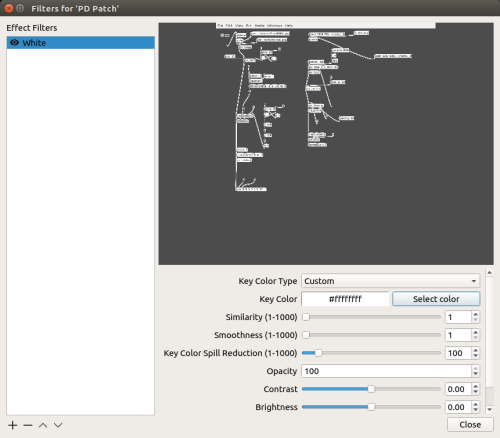 In the next window, under Key Color Type choose Custom and then select the colour. You should choose white (#FFFFFF). You may need to change the settings under Similarity and Smoothness to get the right look. If you’ve just tried this in Pure Data vanilla you’ll notice that your objects are also transparent. I’m using Purr Data (which you should too). In this version of Pure Data all of the boxes are slightly grey, resulting in them not being transparent when you apply the Chroma Key. 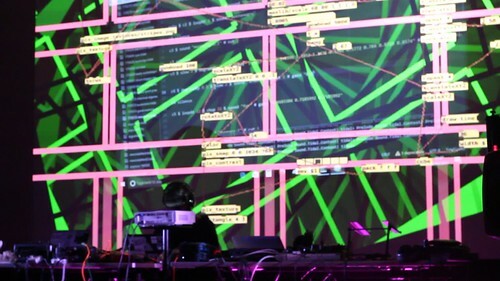 Imagine a scenario where you’re collaborating on an Algorave set with a musician and there’s only one projector. Both will want to project their code but there’s only one projector. What to do?! Luckily a combination of OBS and desktop sharing has you covered. If the musician can share their desktop over a network then you can add that in as a source in OBS and do the usual thing of applying a chroma key filter. However, this requires you both be on the same network, which isn’t always possible or efficient. However, if one of you has a recent Android phone you can get over this hurdle and have high quality desktop sharing quality. 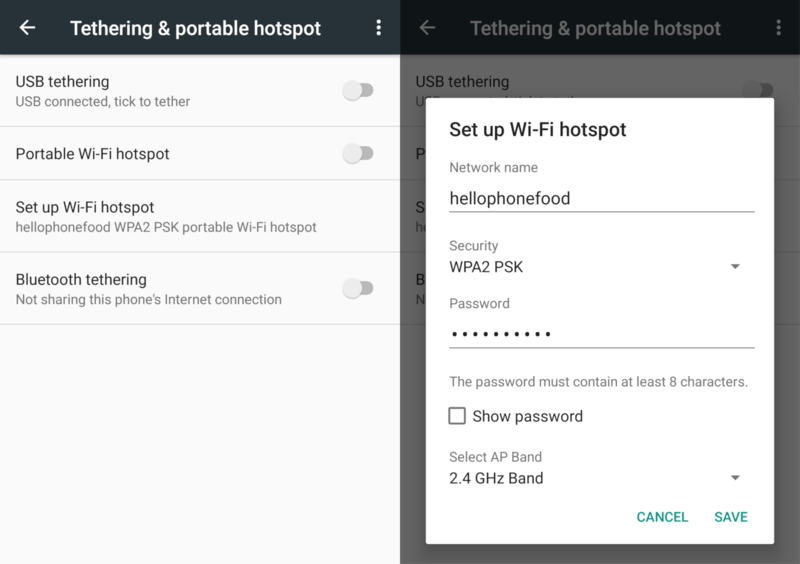 On your phone create a wireless hotspot. You don’t need to use mobile data for this so feel free to turn it off. Connect both machines to this newly created network. 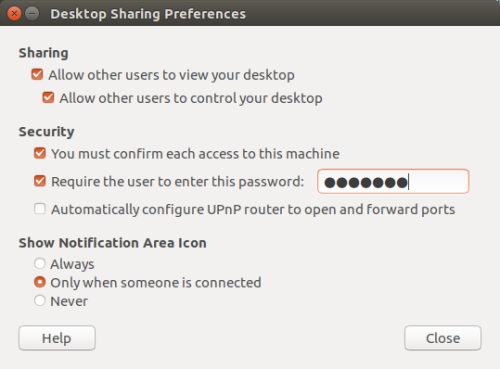 On the remote (musicians) laptop, open Desktop Sharing options and enable the option “Allow other users to view your desktop”. You can choose to require a password and have a user confirm on each new access request. 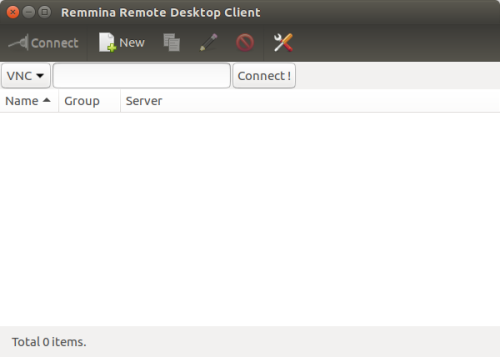 On the host (visuals) machine open Remmina Remote Desktop Client. In this new window click New. 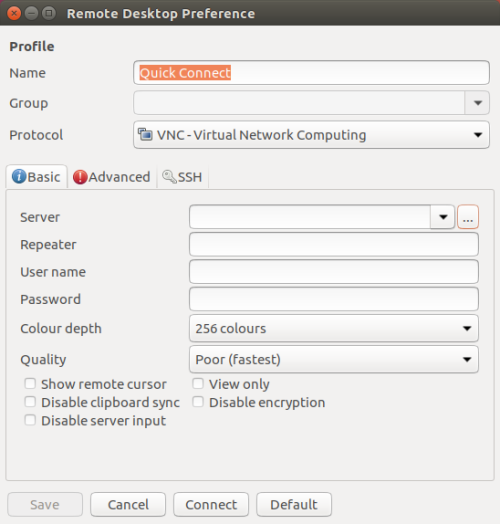 In the next window change the Protocol to VNC – Virtual Network Computing. In the Basic tap below click on the … button. You should see the name of the remote computer listed. Click on one of them. Finally, press Connect. 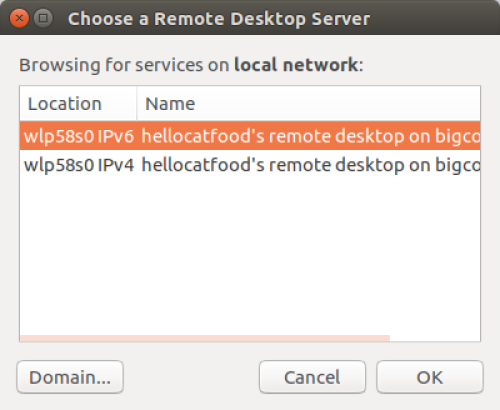 When you try to connect to the remote machine you may get a prompt asking the user to confirm that the connection request is permitted. Once the connection is approved you should see the remote machine on your computer!!! 🙂 And now you can go back to OBS and add that window as a source, apply a Chroma Key effect and then overlay it onto your visuals. Sadly you can’t then use this source to apply as a texture to your objects in Pure Data, but it’s a great start to merging visuals and music live code. I first tried out combining my own code and visuals at the Chemical Algorave in Newcastle and it went really well. I also made use of OBS’s “Apply LUT” filter to change the colour of my whole video output. I then tried incorporating a musicians code at the Algroave at BUMP in Kortrijk.